Let me begin by noting that if you live very close, have kids with you, and are only moderately interested in watching a game, this may be a pretty good choice for you. For someone like me, who has to drive here, has no children, and was very interested in watching the Seahawks game, this was not a good choice. Across the street, where the Redline used to be, and where The Bridge will remain for just a couple weeks, the place was rocking. The Redline in that location went from a place too scary for most the locals, to fairly gentrified, and now, in this new location, to family-friendly and utterly uninteresting to adults. Second, despite having at least a couple dozen people in Seahawks gear, they didn't seem to take the fans' interests very seriously. When someone finally told them we need the channels changed to the Seahawks game, a fellow (perhaps the owner? ), told his customers "Just relax, people." This was right as the team was kicking off, so it was hardly justified to mock your customers for being concerned about actually turning on the game that everyone came to see. Third, at first they would not turn the volume on during the game, and when they did it was not high enough for anyone to make out (and it was far from a raucous atmosphere). 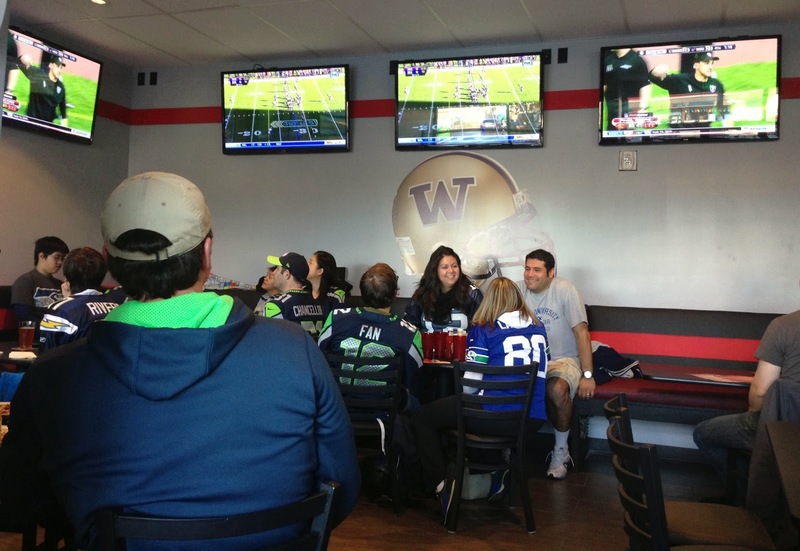 That's would be fine for many places, but if you're not going to have the sound up high enough for everyone to hear during a Seahawks game, it's something like a bait and switch to call yourself a sports bar. Fourth, parking is a mess. There's a tiny lot of with probably 8-10 public spots that was filled, and we had to park four blocks away. Again, that would be unsurprising if we were going to a bar in PIoneer Square or Capitol Hill, but it's surprising in the middle of new developments off the main drag in West Seattle. Finally, the food and drinks were lackluster. I'm willing to give them a bit of pass on this because they are new and were busy. It may take them a few weeks to figure out that the thin bread they use for their French Dip and special is not appropriate for those kind of sandwiches, and becomes soggy before you try and somehow hold it together to dip in au jus. Or that tater tots should be cooked enough to hold together even when you are busy. They did have what looked like a very interesting set of choices in sliders, as well as some pretty basic old school sports bar choices of pizza, nachos, salads, etc. In summary, the food may improve a bit, and they may eventually start to take the whole sports bar thing seriously at some point, and I always wish businesses well in finding their demographic. But given the range of choices in West Seattle I can't see any particular reason for me or any of my friends to choose this place unless they lived in the condos above and didn't want to go out in the rain.